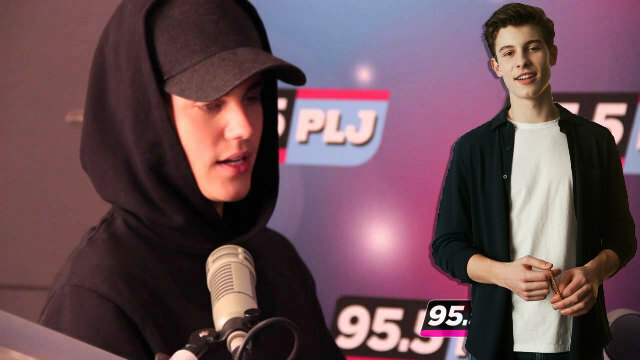 Watch Justin’s reaction when he’s asked about 17 year-old fellow Canadian singer, Shawn Mendes. “Who’s Shawn Mendes?” Justin asks over his shoulder to management off-camera with a faint smile, inserting a plastic soda cap into his mouth. “Nice. Nice. Good for him,” Justin replies, further chewing on the cap. Nope. No one coming to mind. “Oh! Oh wow, so you don’t even… I thought for sure you might because he’s also from southern Ontario,” the host says. “No. No, I don’t know him. But I will check him out. For sure.” Mmhmm. Why he no come back to the Netherlands ? If you know the answer you owe me ten euro . I don’t know who Shawn Mendes is either ! Says an annoying troll on ecstasy @Lokani. Go home you’re drunk @Lokani. You’re not a true belieber are you @Lokani ?-Anya M Rosario signing out. Hello.my name is Anya ,I’m 12 and from Manila ,Philippines . I’ve been a belieber since I was seven . Not once (even when Justin was in the Philippines) have I been to a Justin Bieber concert ,and I really want to . My lifelong dream is to be the one less lonely girl at a Justin Bieber concert ,but now that won’t happen ? -Anya signing out . I hope he comes to Pakistan one day !! There’s lots of beliebers here in Pakistan !! All of us Pakistani beliebers will love it if he did come to Pakistan and do a concert here ,even if it was for 1 hour . I keep dreaming about it ,and not once has he come to Pakistan!! A lot of us Pakistani beliebers cry everyday because he might not come here!! When will Justin Bieber come to Pakistan ?? ? He seems on the defensive. Didnt like his answer. was quite arrogant. Poor shawn. At least he bought stitches on itunes as we can see on instagram..
It’s quite possible that Justin never met Shawn and the kind of music that Justin listens to is not the kind of music that Shawn Mendes makes.. Justin is more into hip hop.